macaroni & cheese: My Vintage Spadea Pattern Collection. 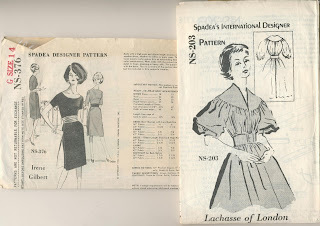 My Vintage Spadea Pattern Collection. Fear not, I only have four. And, one isn't in my size. 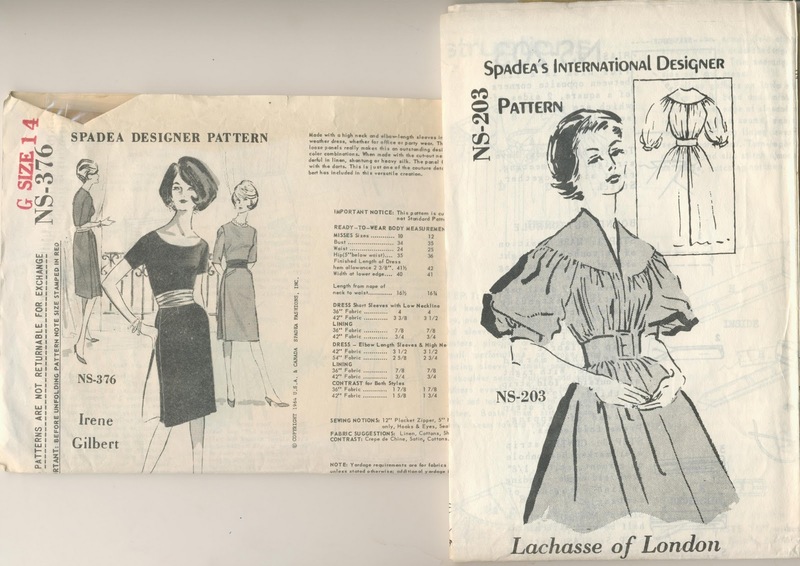 According to the Vintage Pattern Wiki, Spadea offered patterns thru mail order by advertising in Life Magazine, in the 50s, 60s, and 70s. 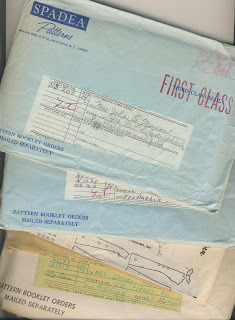 From the postmarks on my envelopes, mine are from the 60s. One doesn't have an envelope, tho, and altho these all came from the same person, I sort of wish I had all of them that she ordered: her "list" is on the front of each envelope and it states that each pattern is shipped separately, so I KNOW she ordered more...where are they?? It sort of makes me sad, because the hoarder in me feels like they were "wasted" somehow by not now being mine. Anyway, here's what in these envelopes!! None of these patterns have been used at all. The dress on the left is spectacular, but the one on the right is too, um, big. Sleeves too poofy, skirt too poofy. In fact, to make my size I need 5 5/8 yds of 45" wide fabric. Holy crap!! I cannot afford to make that dress. I do love this coat (not in my size). It looks very simple to make, and that shape is awesome. The dress on the right is very cute, if lingerie-ish. What's funny is what it says below the illustration: Last minute date or last minute dance? Whip up this little number in something soft and supple to show off in. Omg!! so, one should be able to do this, say, in an hour or so? In our fast paced world, last minute REALLY means last minute and in my mind should take 30 minutes to make or something, when obviously this is not possible. And the showing off part, well, if I looked that cute in that dress, I might also show off. I would especially show off if I were that cute and I MADE THE DRESS IN 30 MINUTES!! 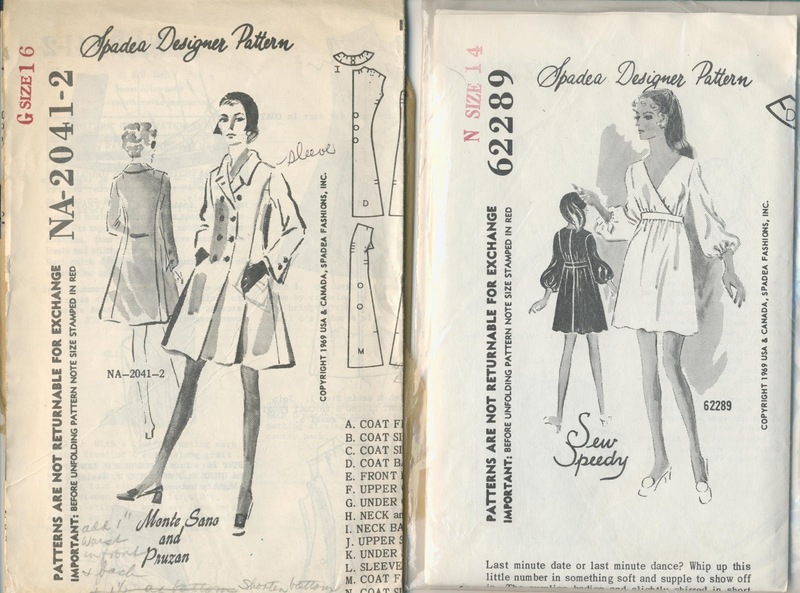 I know I'm always talking about having sewing patterns that don't fit me. I'm not REALLY complaining because I have more patterns than I'll ever use even if I sew an outfit every day until The Rapture. 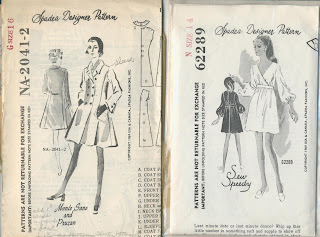 Actually, sewing an outfit every single day would be rather rapturous, in and of itself, but I digress. I found this blog where the author explains a simple method for changing a pattern to your own size. It's pretty great and will probably work relatively accurately (with lots of trying on and a muslin-making) within a size up or down. I'm not sure I would rely totally on this method for making, say, a size 4 into a size 18, or vice versa. But, here it is, nonetheless. How To Resize A Pattern. Don't let a spectacular pattern get away just because it's not the right size: go ahead and get it, and use those instructions to make it fit you.